Quantity: For each 7-quart canner load, you need an average of 14 pounds fresh plums. 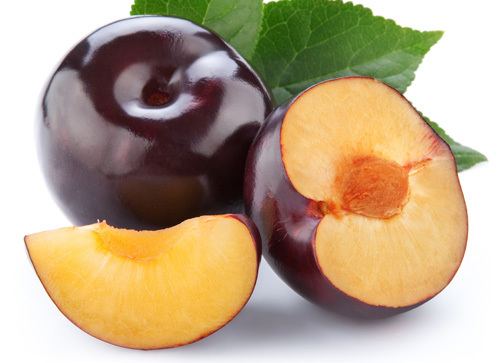 For each 9-pint canner load, you need an average of 9 pounds fresh plums. 2. Stem and wash plums. Prick skins on opposite sides of plums with fork to prevent splitting. 4. Freestone varieties may be halved and pitted. 5. Prepare very light, light or medium syrup. Hot pack or raw pack according to instructions below. Add plums to hot water or syrup and boil two minutes. Cover saucepan and let stand 20 minutes to 30 minutes. Fill jars with hot plums and cooking liquid or syrup; leave 1/2-inch headspace. Fill jars with raw plums; pack firmly. Add hot water or syrup and leave 1/2-inch headspace. 8. Process in a boiling water or pressure canner according to the recommendations. Let cool, undisturbed, 12-24 hours and check for seals.